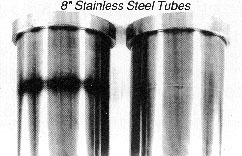 Your #1 source for cleaning Stainless Steel!!! Over 1,900 Satisfied Customers Worldwide! DOWNLOAD our Electronic Weld Cleaner Catalogue HERE! Screenpro has 40 yrs of stainless fab experience. The most powerful Weld Cleaner in the industry. 2,000 Weld Cleaner customers nationally. The fastest Weld Cleaner in the industry. Clean 6 feet of mig or heli-arc weld per minute. Clean inside square corners in only 10 seconds. Safest Weld Cleaner chemical in the industry. Every Weld Cleaner will operate two wands. Always in stock for same day shipping. Free samples of all our additional chemicals. OUR WELD CLEANER SOLUTION IS THE SAFEST IN THE WELDING INDUSTRY! 50 Volts of Weld Cleaning power for each wand makes our Weld Cleaner the fastest! Also cleans aluminum just as quickly! SEE OUR NEW STREAMING VIDEO! Weld Cleaner Video in streaming media format! AC current and chemistry are transferred to the metal by the wand. An instant electro-chemical reaction occurs as electricity and chemistry combine to generate heat, a deoxidizing reaction. This is also called "passivation". Only Screenpro's electronic Weld Cleaner allows you to operate two wands at the same time for twice the weld cleaning production. In this picture you can see the two pieces of 304 mill stainless that have been hand welded by an excellent TIG welder. As expected you can see the ugly heat generated discoloration and what it has done to the stainless. The oxidation caused by the TIG welding has tarnished this piece of stainless steel. Conventional methods of sanding or Scotch Briting the weld stains would create sanding marks that would disturb the surrounding stainless. With a weld cleaner there is no disturbing the metal or the grain of a number four polished stainless steel sheet. All you get is clean welds, see below. The Screenpro Electronic Weld Cleaner utilizes AC current and chemistry that is transferred to the metal through the wand. An instant electro-chemical reaction occurs as electricity and chemistry combine to generate heat, and then creates a deoxidizing reaction. This process is called passivation. No more wire wheels, flapper wheels, roll-lock, grinding stones, sand paper, abrasive wheels, pickle paste or Scotch Brite. As you can see here, the metal is cleaned in a flawless fashion. It leaves even the most highly polished stainless steel immaculate. No more wire wheels, flapper wheels, roll-lock, grinding stones, sand paper, abrasive wheels or Scotch Brite. The labor & abrasive you save in ONE MONTH will pay for the Weld Cleaner! IF YOU'RE NOT USING OUR WELD CLEANER... YOU'RE PAYING FOR IT IN LABOR & ABRASIVES EVERY MONTH! Labor and abrasives are a major part of every company's overhead. By reducing a company's labor, and what they spend on abrasives each year, we have reduced the company's overhead and increased their profits, all at the same time. This is why hundreds of companies that weld stainless steel use a Screenpro Electronic Weld Cleaner. One $7.50 per hour employee cleaning welds cost you $300 per week or $1,200 per month, just for labor. Add in abrasives, power tools, worker's compensation, unemployment insurance, FICA and you're spending more every month for labor and abrasives than it costs to purchase a Screenpro Electronic Weld Cleaner that cleans 72" of weld per minute. Think of the savings! IT PAYS FOR ITSELF IN SAVINGS! And once you own our Weld Cleaner, it continues to pay for itself every month, month after month in saved labor and abrasives. Some of our customers have two, four and six Screenpro Electronic Weld Cleaners. See our customer list of 300 companies, complete with their names and locations. Send us some of your welded parts or scraps of welded stainless steel and we will clean them and send them back to you the same day. 1) Connect the ground and wand to the unit. 2) Clamp ground to the metal being cleaned. 3) Wrap wand with the treated glass cloth. 4) Dip wand into the Weld Cleaner Solution. 5) Apply Solution to the weld being cleaned. 6) Wipe with a damp cloth or rinse with water. IS THE SAFEST IN THE INDUSTRY! Since all electronic weld cleaners vary in output voltages between 24 to 50 volts, it is understandable that there are major differences in weld cleaner solutions. The less powerful electronic weld cleaners require a stronger acid to accomplish the same results. Some of these acids are strong enough to damage both skin and tissue. Unsuspecting companies purchase these weld cleaners because of their low price without realizing the inherent danger of using chemicals that can cause severe burns and injuries. Because Screenpro's Weld Cleaner is the most powerful electronic Weld Cleaner on the market, our weld cleaner solution is also much milder, safer and employee friendly. In fact, you could take a bath in Screenpro's Weld Cleaner solution. It's that safe! Before Screenpro could sell the electronic Weld Cleaner to Disneyland, Disneyworld, Eastman Kodak, General Electric, and hundreds of other major Fortune 500 corporations, the safety departments of all these companies had to approve our Weld Cleaner solution before they could purchase the Weld Cleaner. You may save a hundred or two hundred dollars on someone else's weld cleaner, but at what cost to your employee's safety. One employee accident could mean tens or hundreds of thousands of dollars in workman's compensation or lawsuits. 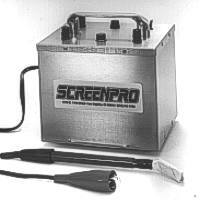 In the 30 years that Screenpro has been building and selling our electronic Weld Cleaner, there has never been a reported accident or claim made against our company. Screenpro will provide parts and service as long as you own the weld cleaner. Simply ship it to us and we will repair it FREE for One Year (a reasonable service fee will apply after the end of the warranty). This is not a throw-away machine. It can be repaired and maintained forever. "Just a quick note to let you know that the Screenpro Weld Cleaner is up and running and doing a fine job, as advertised. The unit has helped significantly in cleaning welds fast and reducing labor and grinding material costs, not only in our Custom Metal Door and Enclosure Products group, but in the Industrial Products Group as well." "We are using the Screenpro Electronic Weld Cleaner everyday, and we are very happy with the results. Thank you for such a useful and practical tool." "Our Screenpro Weld Cleaner is doing a good job. It has helped significantly in cleaning welds promptly and reducing labor and grinding material costs." "Don, we just love our weld cleaner. We use it day and night, five days a week. Over the last five years, it has saved us a fortune in labor- cleaning stainless steel welds." "Dear Don, we love your weld cleaner. Our first one was working great, until it was run over by a forklift. Our second one was so popular, that one of our employees stole it. Our third weld cleaner, is being kept under lock and key." "Dear Don, we just received our Screenpro Electronic Weld Cleaner, and it's everything you said it was. The speed and performance have already exceeded our expectations. Thanks for a great product." See our list of customers in your state for references. THE BIGGEST MISTAKE YOU WILL EVER MAKE IS BUYING THE LOWEST PRICED ELECTRONIC WELD CLEANER! OUTPUT VOLTAGES CAN RANGE FROM 20 TO 50 VOLTS. JUST BECAUSE IT LOOKS LIKE A SCREENPRO, DOESN'T MEANS THAT IT WILL PERFORM LIKE A SCREENPRO. You'll love it, or you don't have to keep it!